Destiny is offering skilled players the chance to score Legendary equipment through its latest special event. Destiny’s Queen’s Wrath event kicked off overnight, and at first glance it appeared as little more than a new category of bounty and a visiting vendor. 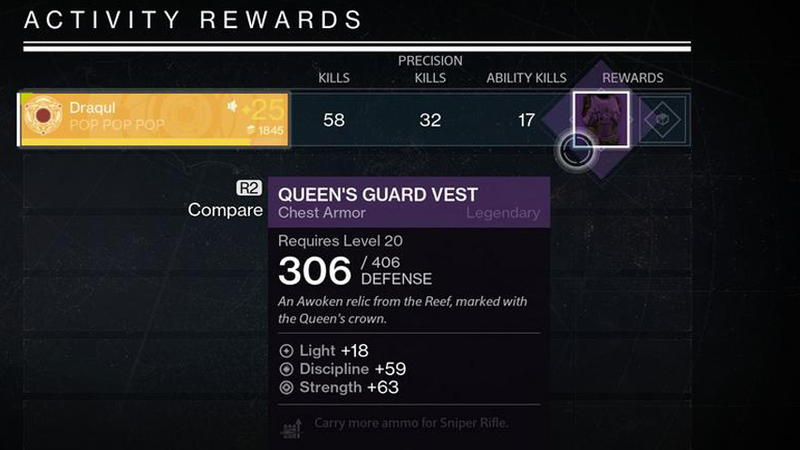 We have a list of rewards available from the Queen’s Wrath vendor here. Some people have been disappointed by the quality of the items offered by the event, but it turns out there’s much better stuff on offer: you can earn yourself a piece of Queen’s Guard Legendary armour by participating in the event. Complete the missions; the armour piece will appear as a reward for all participants. A Kill Order mission is a level 24 Story mission (not new content) with the Epic modifier, among others. You’ll definitely need elemental weapons and abilities to cope with shielded enemies, and you my find yourself repeatedly downed. You can complete as many Kill order missions as you have turned in Queen’s Wrath bounties, so you can collect multiple Legendary items from the event. It’s not clear if there’s a full set of armour on offer; playing four missions last night, I received two helmets and two chest pieces, as did my fireteam. Perhaps gauntlets and boots are not yet available. It’s worth noting that the items are randomised slightly, so picking up spare may result in a piece with better stats for your favoured build. Spares can be broken down for rare materials like Ascendent Shards, too.